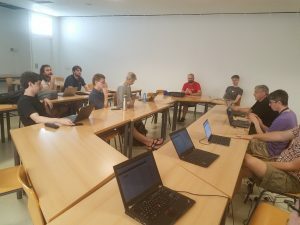 Here is a quick summary of the Flatpak BoF that happened last week at Guadec. We started by going over the list of outstanding 1.0 items. It is a very short list, and they should all be included in an upcoming 0.99.3 release. Alex will do a 0.99.3 release with all outstanding changes for 1.0 (Update: this release has happened by now). Matthias will work with Allan and Bastien on the press release and other materials. Nick is very interested in having information about runtime availability, lifetime and stability easily available on the website for 1.0. We agreed to remove the ‘beta’ label from the flathub website. There was a suggestion that we should have an autostart portal. This request spawned a bigger discussion of application life-cycle control, background apps and services. We need to come up with a design for these intertwined topics before adding portals for it. After 1.0, Alex wants to focus on tests and ci for a while. One idea in this area is to have a scriptable test app that can make portal requests. Automatic migration on renames or EOL is on Endless’ wishlist. Exporting repositories in local networks is a feature that Endless has, but it may end up upstream in ostree instead of flatpak. Everybody agreed that GNOME Software should merge apps from different sources in a better way. For runtimes, the GNOME release teams aims to have the GNOME runtime built using buildstream, on top of the freedesktop 1.8 runtime. This may or may not happen in time for GNOME 3.30.